On the Varsity Team, you’ll push your typographic muscles and actively strengthen your design skills with a monthly portfolio-level project. Build your portfolio and drastically improve your approach, efficiency, skills, and mindset... one month at a time. Each month serves as an online workshop with community support, focusing on an area of knowledge and skill, to help you strengthen your work. When you join the Varsity Team, you will surround yourself with people who won’t let you fail. Work with coaches and fellow designers who understand what it means to create effective and meaningful work. In the process, you’ll gain a knowledgeable sounding board for your ideas, leverage the collective wisdom of the group, learn best practices and fast-track your success. Multiple monthly meetings are facilitated and members are challenged collectively. Once on the Team, you’ll interact with the lead instructors and team members on video calls and online discussions, and be part of a all-star team of designers with similar professional accomplishment. Outside of the monthly projects, the Varsity Team design community also supports your general growth. Design-related discussions and critiques around current client and employer work, pricing and process, tools and tricks, are encouraged. 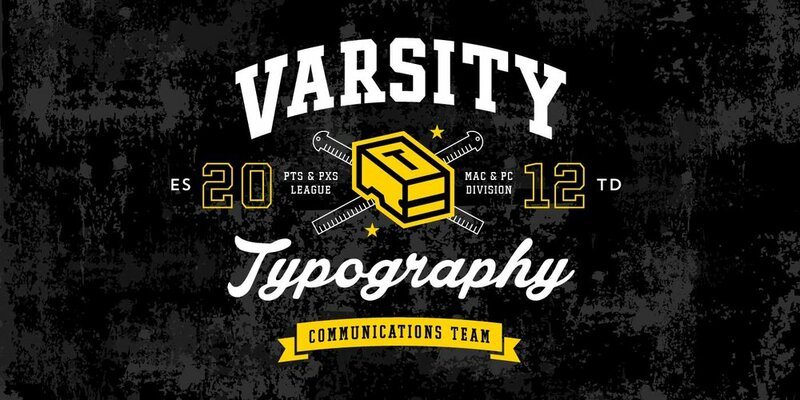 The Varsity Team is your design mastermind, where typography is the core, but we go above and beyond to help you succeed. Our group is focused on improving typography and design ability. Monthly project briefs are presented and each Team member will be challenged to use their design and typography skills to ideate, execute, and efficiently produce a solution. Projects will range from wordmarks to packaging to editorial layouts. The design challenges are portfolio-level projects to help you learn typography lessons, gain practice, and obtain opportunities for support and intense skill growth. Live meeting calls (conducted remotely) will be scheduled on weekends, Pacific Standard Time. Online discussions within the team take place 24/7. If you plan on actively participating and getting feedback on live calls, plan to have open availability during these times. All meetings are recorded in case you cannot attend live. Time for weekly live calls! And if you miss any of these sessions, no worries... the calls are recorded, and replays are posted inside the Varsity Team. The month will kick off with a project challenge, one that will help you get unstuck and push you outside of your comfort zone. The project will be discussed as well as the learning outcomes you can expect from the month’s topic. This call will be public for many to watch, but only Team Members will get access to ask questions and discuss approach and tactics further. Although completing the project is optional, we highly recommend you try to get as far as possible and demonstrate your progress. Four Team Members will hop on a 15-minute 1-on-1 hot seat to discuss planning, ideation, sketches, and progress on the challenge or any other work they need focused feedback from the group. Open office hours with Michael are for a deep-dive into whatever project, challenge, or idea members working on in their day job, passion project, or business. Four Team Members will hop on a 15-minute 1-on-1 hot seat with Michael & Rachel to review their final projects, discuss ways to present, modify, or extend the project for their career portfolio. Being accountable. Team Members will respond with their progress on milestones, even if there is not much to report. Sharing. If members hit roadblocks they will seek help, and if they have a discovery, members will share with the Team. Providing valuable feedback. Team Members will comment and/or critique a minimum of five projects a month in our online forum. Participating in calls. Members will commit to attending at least one live meeting per month. Being trustworthy. All Team member conversations, topics, and/or issues written, spoken, and heard or cannot be shared with anyone who is not a Varsity Team member for any reason without prior written permission. Members will be removed for violating this policy. This rule is strictly enforced to create a safe space for all members. Varsity Team access is $145 per month, or $375 for a 3-month consecutive commitment. Team Membership includes weekly live video instruction, online forum access, and video recordings of critiques. Apply below. Do you need professional development that is transformational, not informational? Are you seeking a support path that helps you work towards your strengths and leverages your design talent? Apply now to see if you’re who we’re looking for. You will hold your spot on the Team by pre-paying and filling out the application. Accepted members will gain access on the first day of the month. When a spot is available, we will inform you of your acceptance, and gain access on the 2nd. If you apply on or after the 1st, you’ll stay on the waiting list until an open spot frees up the following month. Varsity Team registration closes on the last day of each month. Applying to join the Varsity Team. This is a paid mastermind and group coaching program with typography skill improvement as the core focus. Refunds and cancellation requests can only be granted only up until the 3rd of the month.